Family conflict can wreak havoc on people diagnosed with psychiatric disorders. 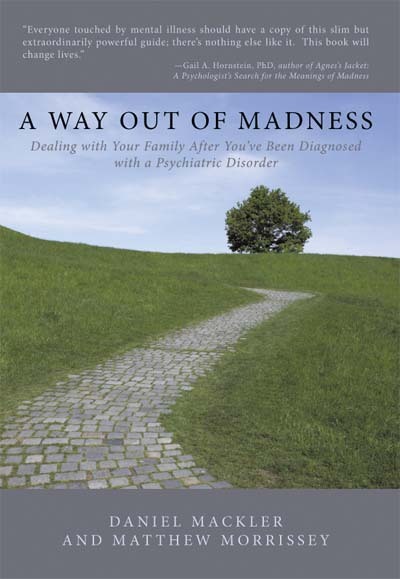 A Way Out of Madness offers guidance in resolving family conflict and taking control of your life. The book, the first in the ISPS-US book series, also includes personal accounts of family healing by people who were themselves psychiatrically diagnosed. "Everyone touched by mental illness should have a copy of this slim but extraordinarily powerful guide; there's nothing else like it. This book will change lives." "Therapists Daniel Mackler and Matthew Morrissey show that learning to deal successfully with family relationships—whether they be a source of distress or a source of comfort—can be the key to recovery. The powerful personal stories in the second part of the book attest both to the wisdom of their advice and to the fact that people can descend into 'madness' and then fully recover, and do so without needing to stay on psychiatric medications for 'life.'" "A compassionate, well-founded alternative to conventional psychiatry. We mental health professionals should take note." "People struggling with the experiences commonly labeled as 'psychiatric disorders' will find not only comfort but solidarity and inspiration in this special book. The authors combine sound advice on navigating family systems with insightful support for finding your own path to wellness." To purchase directly from ISPS-US, at the discount price of $15.00, including shipping and handling, print out an order form (PDF), and mail with your check to: ISPS-US, P.O. Box 491, Narberth, PA 19072. All profits on direct sales will go to support the mission of ISPS-US. To purchase this title online, using a credit card or bank debit, visit the ISPS-US Bookstore at Amazon.